Crowns are one of the most commonly used tools for restoring teeth. They’re caps that cover the entire exposed part of a tooth; they can restore the strength of a badly damaged pearly white or protect it after a root canal. Crowns are one of the crowning achievements of modern dentistry! However, the process of getting a permanent cap installed can be a bit of a hassle. Fortunately, CEREC in Virginia Beach can take the inconvenience out getting one of these tooth covers. What is CEREC, and what advantages does it offer? CEREC stands for Chairside Economical Restoration of Esthetic Ceramic. That’s quite a mouthful, right? Basically, CEREC refers to technology that allows your dentist to design and craft a porcelain crown for your tooth in a single visit. That’s right. There’s no waiting period, and you won’t have to deal with wearing a temporary crown, which may not provide the same level of protection as a customized tooth cap. With traditional crowns, your dentist has to take an impression of your tooth and the teeth around it. Then, the impression goes to a laboratory, where experts create the perfect crown for you. While this is a tried and true method, it lacks the distinct CEREC advantage. With CEREC, no impressions are necessary. Your dentist in Virginia Beach will simply cover the tooth with some non-toxic powder. Afterward, they take some digital photographs. CEREC’s 3D technology then makes it easy for your dental care team to design your crown. Easy, right? After your dentist designs your crown, that information will go to the CEREC machine, which uses a single piece of porcelain to mill your new tooth cap. There is no compromise on quality. In fact, these porcelain crowns can last for a decade or longer. 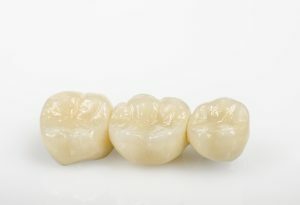 Another thing that many people love about CEREC porcelain crowns is that, because they’re made of porcelain, they can blend right in with the natural teeth around them. This is in sharp contrast to metal crowns, which stand out like a sore thumb against the backdrop of the pearly whites that nature gave you. Porcelain CEREC crowns are among the best things that modern dentistry has to offer. If one of your old crowns is wearing out, or you will soon need to have a new crown installed, find a dentist near you who uses CEREC technology. After the initial consultation, you may be just one dental visit away from a stronger, healthier smile. However, keep in mind that crowns aren’t always the ideal solution for badly damaged teeth. Your dental care professional might recommend a different restorative method to get your oral health back on track. Need a crown? Why not head to the nearest dentist who offers CEREC? Dr. Stephanie L. Santos owns and manages Smile by Design in Virginia Beach. She and the rest of her team offer general and restorative dentistry to help their patients achieve their best possible smiles. If you have questions about CEREC crowns, contact Smile by Design at 757-499-9639.